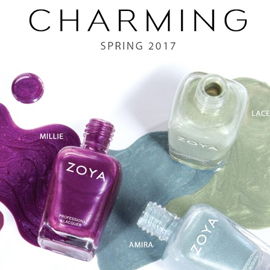 The formulas are fairly standard for Zoya, good opacity and spreadability. I've noticed that they'll stay on longer if I use a base coat and top coat, but they still tend to chip and lift after a few days. The colors are all attractive enough, but for my purposes, I only am interested in two - the light blue (Amira) and green (Lacey) light-shimmer finishes.